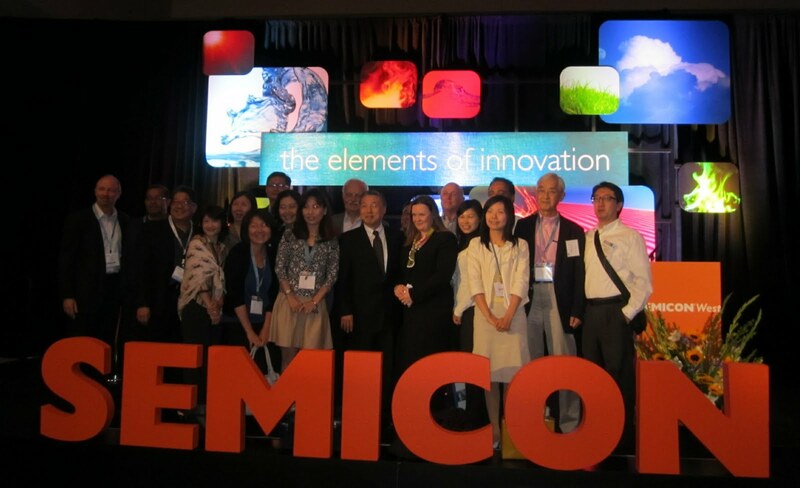 At the recent Semicon West event in San Francisco, Tien Wu, COO of ASE, was the keynote speaker at the opening ceremony. Prior to joining ASE in 2000, Wu held several management positions within IBM. According to Wu, the 53 years old semiconductor industry now accounts for 0.6 percent of worldwide GDP. He sees the semiconductor growth rate converging to ~ 7%. For the period 2011-2015 he is forecasting four years of stability with “mild growth” He sees this as a period of consolidation where only bold companies (“the bold ones”) will continue significant R&D and CAPEX spending. 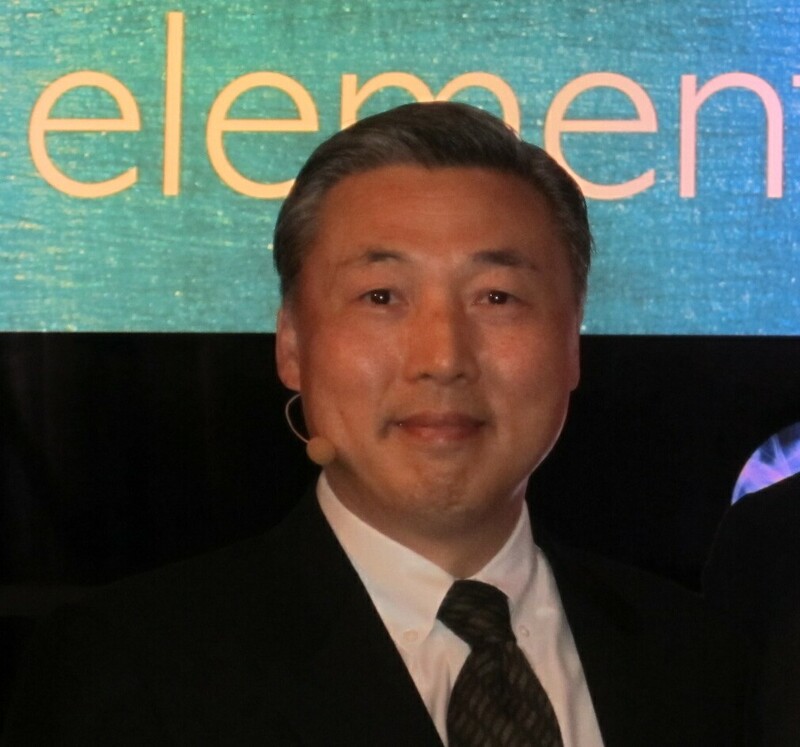 Wu described growth in the semiconductor industry over the past several decades as being driven by key applications. Aerospace in the 1970s, mainframe computers in the 1980s, PCs in the 1990s (global penetration now ~ 20%) cell phones in the 2000s (global penetration ~ 60%) and smart appliances in he 2010s . Wu noted that all of the applications are still running in huge volumes today. When comparing front end and back end operations Wu quoted figures showing that from 1980 to today $500B in CAPEX has been spent on the front end operations (avg of $26B/yr) whereas only $133B has been spent on the back end. Steve Lerner, CEO of French startup Alchimer [see PFTLE 124; IFTLE 12] notes that progress is being made using their electro and chemi grafting products in the MEMS arena. Earlier this year Alchimer announced that the Microelectronics Innovation Collaborative Centre [C2MI (Quebec)] had licensed Alchimer’s Wet Deposition process for MEMS 3D Research [link] to support the center’s 3D MEMS programs. for 3D Interposer and via last (backside) packaging is showing significant cost reduction for these applications. AquiVantage uses the same basic technologies as the Alchimer’s wet processes for TSVs, reportedly providing concurrent wet deposition of TSV and front-side isolation, barrier, and copper fill/RDL, while eliminating CMP and dry deposition steps. It also supports smaller vias with higher aspect ratios. On the backside, the AquiVantage process allows selective maskless growth of the on-silicon isolation layer, eliminating an expose/develop/etch/clean lithography process cycle. IFTLE sat down with Paul Linder, executive technology director and Markus Wimplinger director of EVGs business unit for technology development and intellectual property, to discuss their views on 3DIC commercialization and better understand their new temporary bonding metrology module which seeks to minimize the product at risk in a production environment. Wimplinger noted that they have 1 customer already in production and that several are very close. 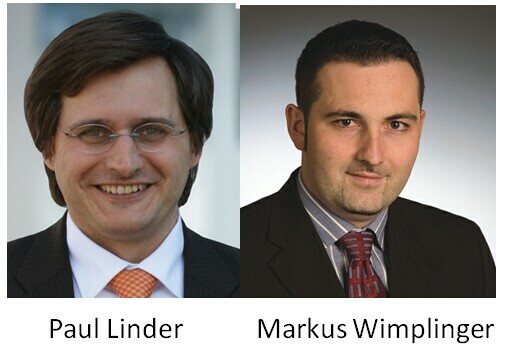 Although they are wary to name names without customer approval , we have all seen their joint announcements with Amkor and their equipment installed at the joint programs of Leti / ST Micro and Fraunhofer Dresden and Global Foundries. When asked to sum up their activity in the now retired EMC-3D consortium of which they were a co-founder, Linder indicated that the EMC-3D roadshows were helpful to show the industry that there is a supply chain for 3DIC and that the technology was doable. Linder reports that by the end, there was a clear consensus on a std process flow and all in all he views this as a very successful collaboration. EVG has recently announced that they have joined the Ga Tech 3D Systems Packaging Research Center as a Manufacturing Infrastructure Member. Linder indicates that their mission is to develop “â? ?¦technologies that will make silicon and glass interposers with TSVs a truly affordable packaging solution." EVG’s temporary bonding and debonding, chip-to-wafer bonding and lithography technology and process know-how will be included in the PRC’s Silicon and Glass Interposer Industry Consortium research program. EVGs new inline metrology module reportedly allows customers to implement in line process control for thin wafer processing. The in line metrology module can detect a variety of process irregularities and defects during temporary bonding and debonding including the TTV (total thickness variation) of the carrier wafer, adhesive layer, bond stack and thinned wafer; bow/warp of the boded stack and voids in the bond interface. Leti presented informative data on polymer filing of vias last (backside) TSV. The normal Leti process a wafer is bonded on a temporary glass carrier and thinned down to 120µm. 40-60µm diameter vias are then performed by DRIE in silicon. A 2µm thick SiON insulation layer is performed by PECVD. A plasma etching is then performed to open contacts on metal level in TSV bottom. Due to the TSV dimensions complete filling with a metal is not appropriate due to issues including process time, process cost, metal overburden thickness and thermo-mechanical stress. For these reasons, a copper liner is electroplated inside the TSV. This liner also forms the RDL layer on the wafer bottom surface. A 7µm thick polymer layer is then coated on the RDL in order to insulate it This layer, realized by spin-on of a liquid polymer, tents the RDL and TSV without filling it, as shown in the figure below. This leaves the copper liner inside the TSV exposed to trapped air (oxidation). In addition, the thin polymer layer over the TSV is a weak point where temperature variation (during following process steps or device lifetime), can break or crack the layer. In the modified "polymer fill" process a 20 to 30µm thick polymer layer is coated by spin-on on the wafer. Vacuum heating is performed decreasing the polymer viscosity and allowing easier removal of the air trapped in the TSV. Temperature and the pressure during the vacuum heating has to be optimized for each different polymer in order to obtain complete filling of the TSV. 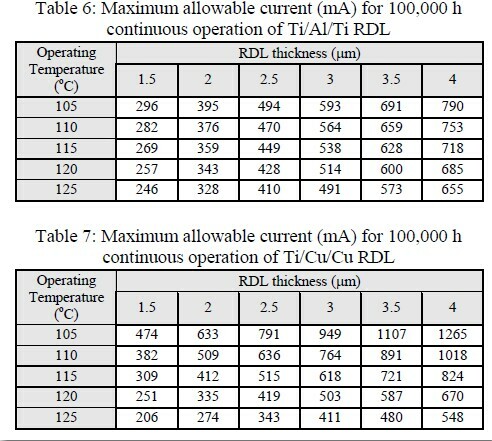 Trials have been done with two polymers having different thermomechanical properties (see table ). Researchers at Renesas described a unique process flow for achieving fan out WLP (FOWLP) by an RDL first method. 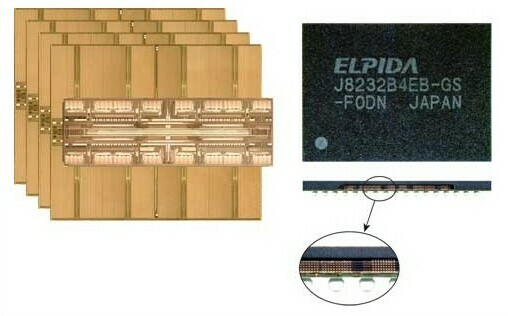 The fabrication technology used for most FOWLPs is a chips first method (shown in the figure below) where the chips are mounted to a carrier face down; the chips are molded into a wafer and the carrier removed; RDL and terminations are formed and the packaged chips subsequently singulated. Renesas repots limitations to this process flow include (1) The I/O pitch of the embedded chip is limited by alignment mismatching between the chip and the RDL; and (2) The RDL requires a low-cure temperature resin which may negatively affect package reliability. 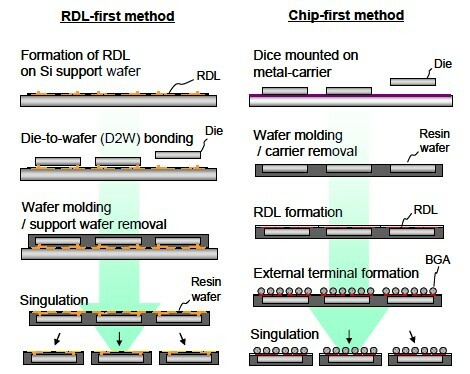 Renesas suggests a RDL first approach which they note is based on their earlier work with NEC on the SMAFTI program ( smart chip connection with feed through interposer). The process flows are compared below. 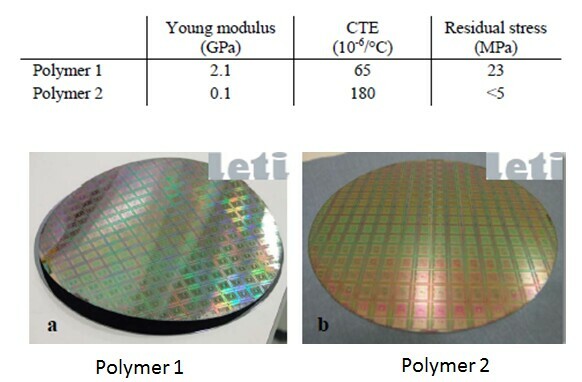 They claim that a finer chip I/O pad-pitch is achieved due to better CTE matching between the die and support wafer and that the high-cure-temperature resins used, make the RDLs more reliable. Their name for this is SiWLP for SiP (system in package) WLP. Another acronym I greatly dislike since it will always be interpreted as "silicon WLP" for obvious reasons. 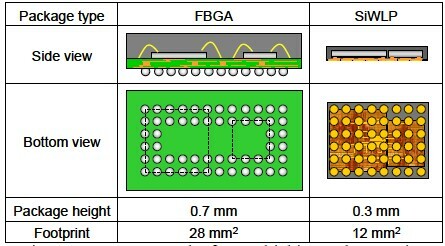 The figure below compares a WB-BGA solution to a SiWLP solution for a 6 mm2 analog chip and a 3 mm2 microcontroller. It indicates that the SiWLP enables a 57 % reduction in area compared to conventional WB-BGA-type SiP. A joint publication between RTI Int, U Texas-Austin and Microelectronic Consultants of NC took a close look at the mechanical properties of low temp ( ca 200 C) cure polymers [Asahi Glass-ALX; Hitachi-DuPont-PBO and JSR-WPR 5200]used in RDL type applications. Getting thin film specimens [10-20µm thick samples] properly fabricated and loaded into a test system is not a trivial task. Reproducible data requires samples that are lithiographically prepared (not cut with a razor blade) and requires compliance correction factors be calculated. The following table shows vendors reported data vs data gathered in this study. Manufacturer reported modulus numbers were in all cases off significantly (ca 50%) and in some cases elongation and tensile strength numbers showed quite a large spread indicating that even in this study, where extreme caution was taken to prepare the samples, flaws must have been present. MOSIS is gathering participants and will manage the program. Tezzaron CTO Bob Patti reports that they will "…provide the PDK (design kit), assist with 3D design issues, do the 3D assembly, and deliver the finished components". For all the latest on 3D IC and advanced packaging stay linked to IFTLE…..
Just finished a trip to Semicon West and a short vacation in New Mexico with the kids I grew up with many years ago in "the city". For those with interest in NYC in the 50′s and 60′s try out our web page at http://www.lasallejhs17.com/index.html. Several of you at Semicon West requested that I make the figures larger (i.e more readable). I am stuck with the limitations of "blogger" software which is very HTML sensitive but I will try. Anyway, this week we will continue to take a look at packaging activities at the 2011 ECTC. Samsung found that Ni3Sn4 IMC formations at interface between SnAg solder and their 4µm Ni UBM degrades the mechanical properties of solder joint, and increases resistance of solder bump. IMC growth rate and Ni UBM dissolution rate were calculated. Thin IMC changes into thick IMC during HTS. During 150°C annealing for 1300 hours, Ni UBM was converted into Ni3Sn4 IMC. 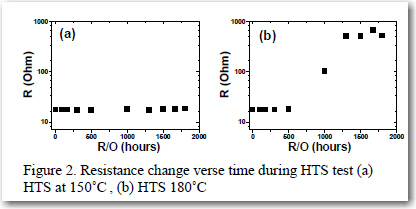 Even though there are such microstructure changes, resistance of micro bumps were not changed during HTS 150°C. Resistance started to degrade after 1000 hours at 180°C due to void formation at interface between IMC and Al trace line. They found that open failure occurred when Ni UBM completely consumed and failure time is consistent with total consumption time of Ni UBM. 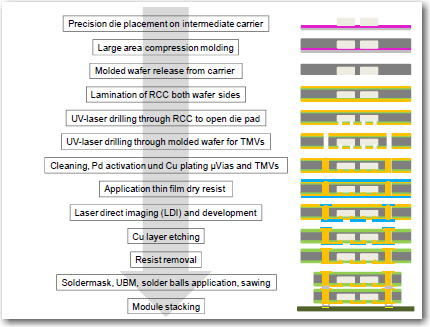 ITRI reported similar results on their 12µm microbumps (5µm Cu/3µm Ni/2.5µm SnAg) on 20µm pitch. The intermetallic phase formed at the interface was identified as Ni3Sn4, the thickness of this layer increases with time and/or temperature in agreement with the results of Samsung. They also found problems with seed undercut during processing. When the thicknesses of the Cu seed layer sputtered on the wafer was reduced from 5000Å to 2000Å and a dry etching was used to remove the seed layer after bump plating and PR stripping, the undercut of Cu posts could be confined to less than 10%. A dramatically undercut Cu pillar (left) takes on the appearance of mushroom plating. ITRI reports that conventional reflow with flux is seldom used for the assembly of microbumps because the gap size between chip and interposer, i.e. 20µm, makes it difficult to remove flux residues which could cause void formation within the underfill and degrade the reliability. Qualcomm and STATS ChipPAC reported on the unique combination of copper pillar bump and bump on lead (more accurately called bump on trace). Their suggested acronym CuBOL just doesn’t identify the structure well enough for me, so I prefer and humbly suggest CPBOL for copper pillar bump on lead. The technology which utilizes the fcCuBE technology of STATS ChipPAC (see USP 7368817), involves using Cu pillar bump attached to a narrow trace or "bond-on-lead (BOL)" without any solder resist confinement (open SR) in the peripheral I/O region of the die. This enables improved routing efficiency on the substrate top layer thus allowing 4L to 2L reduction in the substrate without compromising functionality. The cost of the FC package is lowered by means of reduced substrate layer count, removal of solder on pad (SOP) and solder mask and relaxed design rules. BOL or narrow pad which takes significantly lower space on the top layer allowing more area for escape routing; thus enables relaxed Line / Space (L/S) design rules which in turn help to lower the substrate cost significantly. Similarly, the ‘Open SR’ concept in CuBOL further allows additional escape routing to be fit in the same bump-to-bump spacing; which offers increased routing efficiency and I/O density on the top most layer. The combination of BOL and Open SR together thus allows conversion of 4L substrate design into 2L without compromising I/O density. ITRI reported on their studies fluxless joining of 30µm pitch Cu/Ni/Sn-Ag bumps. In this study, the Ar + H2 plasma treatment was applied on the C2W process for the purpose of tin oxide removing and enhancement of the bondability. During bonding they found that gap control was very important since poor control could lead to a narrow necked joint ( c) or solder ozzing out of the joint and possible causing shorts (b). After bonding and underfilling, temperature cycling test (TCT), high temperature storage (HTS) at 150°C, highly accelerated stress test (HAST) and electromigration (EM) reliability were performed on the chip stacking module to evaluate the reliability of solder micro bump interconnection assembled by the C2W process. Without underfilling a significant number of samples failed . With underfilling HTS greater than than 2000 hrs; TCT greater than 3000 cycles and HAST testing were confirmed. The silicon interposer test chip with thousands of micro-bumps at 45µm pitch has been fabricated. The silicon interposer is 100µm thick, and is mounted on a 42.5mmÃ? ?42.5mm substrate through 180µm pitch C4 bumps. The TSVs are typically 10-20µm in diameter and 50-100µm deep. The walls of the TSV are lined with SiO2 dielectric. Then, a diffusion barrier and a copper seed layer are formed. The via hole is filled with copper through electrochemical deposition. The interposer wafer is thinned to expose the TSV from the bottom side. The Cu overburden is removed by CMP followed by passivation and UBM process. C4 bump is electroplated and reflow soldered on top of the UBM layer. FPGA wafers are bumped to ultra-fine pitch in the range of 30-60µm using Cu pillar bump technology. The FPGA dies are diced and attached to the interposer top pads. The gap between the interposer and the FPGA die is filled using underfill material to protect the micro-joints. X sections of the overall assembly, the interposer and the micro joints are shown below. Main focus of this study was to understand the impact of moisture and temperature cycling on the microbumps and adhesion of the underfill to top FPGA die and thin TSV interposer substrate. Underfillls were first evaluated and found to perform better with no clean flux. Plasma cleaning was implemented before underfilling and gap height was increased to improve underfill flow. With improved gap height and plasma cleaning, no delamination was observed either in L5 preconditioning or after 264 hrs of HAST at 110°C. All the samples passed 1000 cycles of TCB. Cross-sectioning of interposer after 1000 cycles confirmed that there was no protrusion of TSV. An example of cross-section of micro joint after 1000 TCB cycles. Fraunhofer IZM examined chip embedding into polymer by molding and redistribution by PWB technologies for highly integrated low cost packages. The general process flow starts with the lamination of an adhesive film to a carrier. This adhesive film has one pressure adhesive side and one thermo-release side (heating the tape, the thermo-release side of the tape loses its adhesion strength). Dies are placed, active side down, towards the carrier. Molding is done by large area compression molding. For chip redistribution, resin coated copper is used. 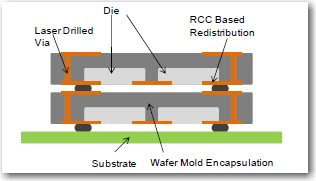 After lamination of the RCC film on both wafer sides in one step, micro vias are laser drilled to the die pads and through mold vias in the same process step to connect to and bottom side. By plating both, via filling and die pad connection to the copper layer and the top copper layer to the bottom copper layer are achieved. Mold materials with small filler particles (maximum filler particle size of 25µm) allow the fabrication of vias with a very precise and smooth via surface but materials with finer fillers currently have higher viscosities and lower filler content leading to a higher CTE. Customers have been using two-layer 0.8mm packages, rather than the thicker 1.0mm four-layer PoP, so systems needing 8GB of DRAM needed two stacks of 4GB product. Now they can get four layers of 2GB in one package. Yields and cost are reportedly the same as for existing 1.0mm products. Advantages of PoP for mobile devices includes: mounting space is reduced, individual packages can be tested, less wire bonding used (minimizes losses. Volume production ramp is slated for 3Q11. The device is a “low power 8-Gb DDR3 SDRAM that consists of four 2-Gb DDR3 SDRAMs fitted to a single interface chip using TSV”. Target applications reportedly include tablet PCs, extremely thin PCs and other mobile computing systems. The new TSV DRAM will reportedly enable significant energy savings as well as making portable electronic devices smaller, thinner and lighter. Elpida believes that the new devices in notebook PCs will demonstrate a 20% reduction in operating power and a 50% reduction in standby power compared with systems that use the standard SO-DIMM configuration which use standard wire bonding technology. Power consumption is reduced because the TVSs shorten the interconnect between the chips, thus reducing parasitic resistance and capacitance. In addition, chip height is decreased and the DIMM socket is eliminated. Chip mounting area is reportedly reduced 70%. In mid June MOSIS announced their Multi Project Wafer (MPW) services would now allow users to test out 3D-IC concepts using the same provider and model they currently use for their standard semiconductor processing. 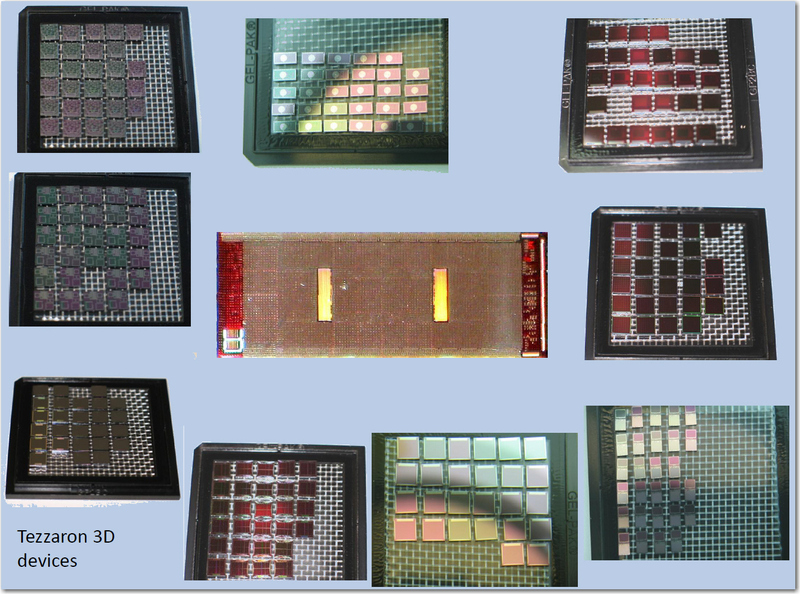 MOSIS has previously been known for its low-cost prototyping and small-volume production service for VLSI circuit development [www.mosis.com]. Working with Tezzaron and Mentor Graphics, MOSIS will manage MPW projects including reticle creation, fab reservations, final packaging and testing, and other logistics. The Tezzaron process will enable designs using tens of millions of TSVs with dimensions as small as 1.2 x 6 um and 2.4 um pitch, producing up to 300,000 vertical interconnects per mm sq. Tezzaron will also provide backend manufacturing steps including wafer thinning, backside metal and wafer bonding. Mentor Graphics provides DRC and LVS tools that support 3D-IC physical verification, ensuring that designs are correct and will meet 3D process requirements and are manufacturable. Customers can use the MOSIS 3D-IC service to create proof-of-concept ICs that demonstrate the use of high-density TSVs in various applications. Medigus, a leading developer of endoscopic and visualization medical devices, and TowerJazz, announced successful sampling of the second generation of TowerJazz’s CMOS imager that serves in Medigus’ line of disposable miniature cameras. The use of disposable cameras eliminates the need for the very expensive and time consuming sterilization process commonly associated with endoscopic procedures. The camera’s diameter is only 0.99 mm, the first video camera in the world with a diameter smaller than 1 mm. Medigus will begin supplying samples of the camera to customers in Japan and in the US for cardiology procedures. The camera will be integrated in Medigus’ other endoscopy products. The disposable camera sensor will be manufactured in TowerJazz’s Fab 2 using its 0.18-micron CMOS image sensor process and will be integrated into the camera produced in Medigus’ manufacturing facilities. TSV are used to minimize the camera’s size and reduces production costs in high volumes. For all the latest in 3D IC and Advanced Packaging stay linked to IFTLEâ??¦.. We continue with our look at the major themes presented at this years ECTC Conference. This week we will look at presentations concerning Electromigration (EM). Electromigration continues to be a topic of intense study. Several papers have reached the conclusion that copper pillar bumps are more EM resistant that normal UBM/ bump structures. Many groups are also concluding that the smaller micro bumps are also more resistant to EM. ASE has released data from their studies on the effect of EM on RDL traces in wafer-level whip-scale packages. The first RDL structure was sputtered Ti/Al/Ti (0.2um/1.5um/0.2um) combined with a sputtered UBM: Al/Ni(V)/Cu (0.4um /0.325um /0.8um). The second RDL structure consisted of Ti/Cu/Cu (0.1um /0.2um /4, 6, or 7.5um electroplated Cu) combined with Ti/Cu/Cu UBM (0.1um /0.2um /8um electroplated Cu). Based on Weibull characteristic lifetime plots derived from their data, ASE indicates that the maximum allowable electric currents for 100,000 h (11.4 years) continuous operation without electromigration damage for Ti/Al/Ti and Ti/Cu/Cu RDL with 25um wide RDL traces. The results indicate that Ti/Cu/Cu RDL performs better than Ti/Al/Ti RDL at low operating temperatures while features relatively shorter lifetime at high operating temperatures. In a similar study on their eWLB package, Infineon finds that the most critical spots susceptible to EM voiding at high current loads turned out to be the terminations of RDLs with transition to the chip pad or the solder ball, respectively. 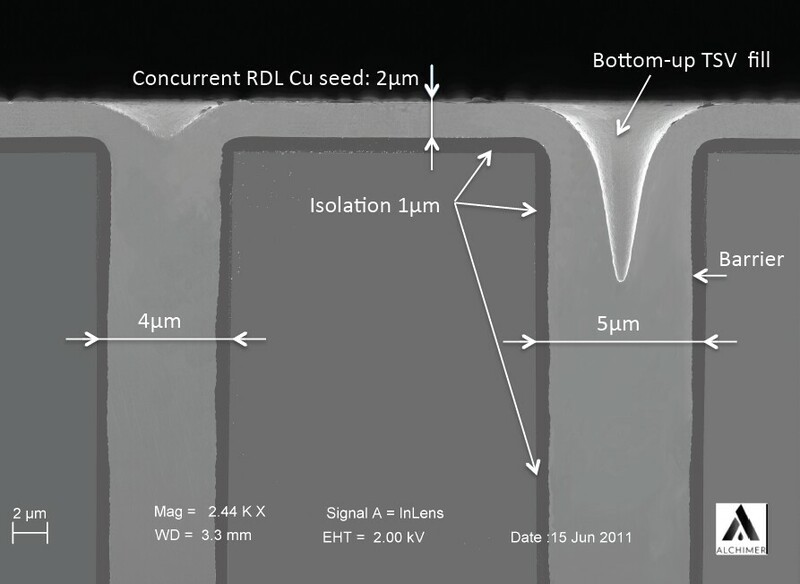 The critical electron flow at the RDL/chip pad interface is the downstream direction since the current densities in the thin aluminum line are much higher compared to those in the thicker Cu RDL. The voiding occurs in the aluminum pad underneath the RDL via followed by liner punch-through. The interface between SAC solder ball and RDL shows a distinct bimodal failure behavior of which the root cause could not be identified. The upstream stress direction turned out to be the critical electron flow direction. The voiding is driven by copper migration and occurs at the very transition between RDL feeding line and solder ball, which is the location of the highest current density, defined Cu/Cu3Sn IMC boundaries and pre-existing Kirkendall voids. A significant boost in lifetime can be achieved by changing the ball pad construction (e.g. thick Cu UBM) or by means of layout optimization (RDL via size, RDL shape). Amkor fabricated a special test vehicle to get a direct comparison of Cu Pillar EM with that of various solder bump compositions. For solder bumps a TiW(1000A)/Cu(1500A)/Ni(2um) UBM stack was used. For Cu pillars, 55um of Cu was plated up on sputtered TiW/Cu. The Cu pillars were then plated with 20 and 40um SnAg solder to form solder caps. 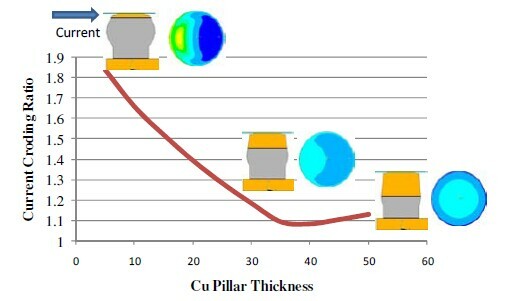 More than 8000 hours of testing on flip chip solder bump and Cu Pillar, revealed that Cu Pillars have the best reliability amongst the four bump metallurgies ( vs high Pb ,eutectic SnPb and SnAg ). 5 combinations of current and temperature were used to estimate the current carrying capacity of Cu-SnAg-Cu Î¼-bumps of 25um diameter. The Cu-SnAg-Cu micro bump structure was tested for 5500+ hours without any failures. The EM results for the tested structures is shown below. The data shows lower EM performance for high Pb bumps compared to other bump compositions. High Pb bumps usually considered resistant to electromigration. Published data shows high Pb bump to be better performing than eutectic SnPb bumps. In this Amkor study, the failure analysis showed that the failures occurred on the substrate side with cracks occurring between the Cu-Sn intermetallics and substrate Cu pad. This study used a Cu SOP substrate finish and TiW/Cu/Ni UBM whereas previous data was based on ENIG finish on the substrate and Ti/Ni(V)/Cu UBM. The surface finish turned out to be the main reason for lower EM performance. Cu pillar height was varied from 5 to 50um and current density distribution was determined under the pillar. Current crowding is highest with 5um thick pillar with maximum current density on the left side of bump (the side current flows in from). As the pillar height was increased, the current crowding ratio continued to reduce until the pillar height of 35um. A further increase in pillar height, however, started to increase the current crowding ratio slightly. Since lower pillar height is preferred for reducing stresses, Amkor concludes that a 35um pillar height might be optimum for both EM and mechanical reliability. IMEC reported on their studies to compare standard NiAu/SAC (SAC=SnAgCu) solder bumps with Cu pillar bumps in terms of their electromigration behavior. Both bump configurations were flip chipped onto package substrates with a thick Cu finish. 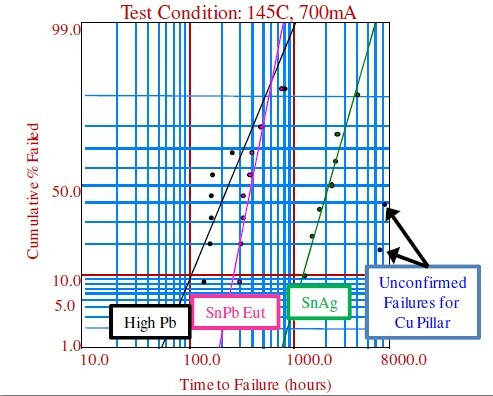 The Cu pillar bumps, which are soldered with a thin SnAg cap do not show any significant electromigration damage and do not fail within reasonable testing times and test conditions. IMEC concludes that the rapid formation of a full intermetallic phase is believed to be the main course of the outstanding electromigration performance of the Cu pillar bumps. Standard solder bumps with Ni/Au UBM show a constant failure mechanism of micro-structural degradation through void formation at the interface of the solder and the intermetallics. This occurs for all test conditions used (150-170°C and 300-500 mA). TSMC in two separate studies first compared the EM performance of C4 and micro bumps and then examined the EM effects of micro bumps in a 3DIC package. 1Ã? ?3 sq mm silicon test chips were populated with the 75-95um diameter SnAg solder bumps which are then mounted on a 12Ã? ?12 sq mm organic substrate. Surface finishes of both Cu SOP and ENEPIG were studied. For the micro bump EM samples, both 2Ã? ?3 sq mm and 3Ã? 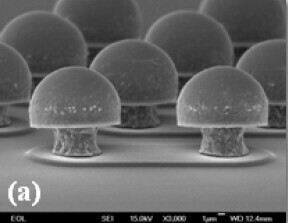 ?4 sq mm Si on Si stacked packages were used. 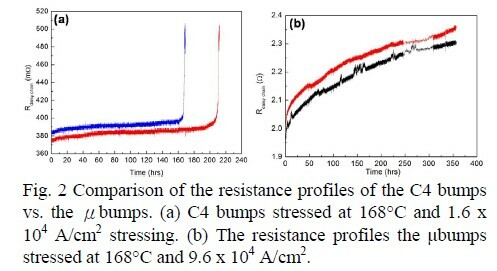 The resistance profiles of the stressed C4 bumps are distinctively different from those of the micro bumps. The early failure commonly observed in the C4 joint is not observed in the micro bump joint. The steady resistance increase in the micro bumps is dominated by IMC formation, which has much higher resistivity than that of Sn [The electrical resistance of Cu-Sn IMC is about 1.5 times more than that of pure Sn, 2.5 times more than that of pure Ni, and 10 times more than that of pure Cu.] There is no obvious void formation from EM stressing even though it has been stressed for a prolonged time with up to 6 times the current density of the C4 bumps. TSMC concludes, however "this does not imply that the micro bump joints are immortal for EM. The failure can still occur by Cu consumption when disproportional amount of solder volume and UBM thickness is selected." In their second paper EM effects of micro bumps in 3DIC package configurations were examined. Two structures were designed and fabricated: (1) joining of Sn-capped Cu post to ENEPIG (electroless-nickel-electroless-palladium-immersion-gold) UBM pad on silicon substrate and (2) joining of top Cu post to bottom Cu post that forms a symmetrical joint structure (shown below). 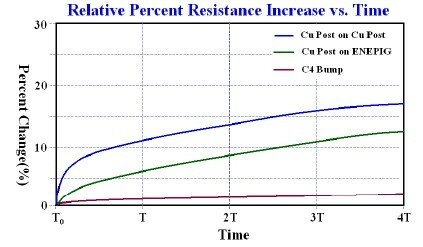 Resistance changes compared to a C4 bump are shown below. The resistance shift profiles for both the post-on-post and the post-on-ENEPIG schemes are found to have rapid increase in the beginning and then steadily increment for the long run. TSMC correlates this to the solder wetting on Cu that allows for rapid Cu-Sn IMC formation upon EM stressing, and results in Cu continuing to diffuse for the long stressing period. The resistance change is controlled by the contact area of Cu-Sn interface. Since the solder wetting on Cu enlarges the Cu-Sn contact area, rapid IMC formation occurs. They conclude that "it is very crucial for precise control on the Ni fabricating process as Cu diffusion barrier between Cu and solder to limit the contact of Cu and Sn." 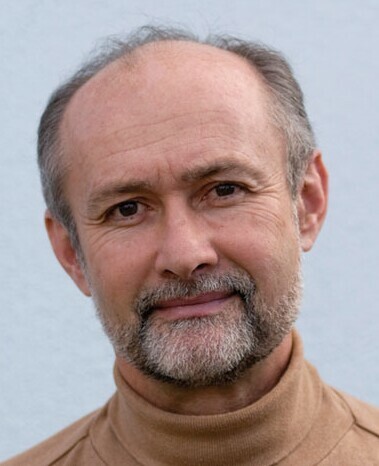 You are currently browsing the Insights From Leading Edge blog archives for July, 2011.